Earlier this semester I pitched the idea to the Entertainment Software Producers club at Georgia Tech to get some people interested in the project. I did indeed get some interest from three people who wanted to help, but unfortunately we weren't able to reliably meet and I officially sidelined the project until Spring 2009. Despite this, I have continued some work on the project to keep it alive and not let it become stale. I have so far created a foundation for the project with the Irrlicht engine and have been at work on modules that will be integrated later as part of the application's physics and object management engine. One of these is the ProjectileManager class. As projectile weapons in the game fire, they will create a Projectile object and pass it to the ProjectileManager which will keep track of all living Projectiles and calculate their movement between frames and detect collisions. 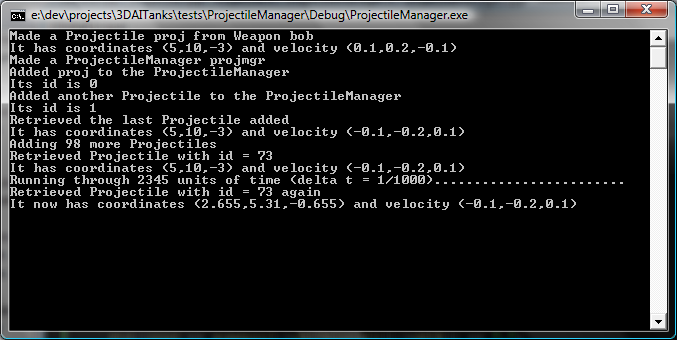 In this screenshot, a test of the ProjectileManager is occurring. Some projectiles were created and their motion was calculated over time. The ProjectileManager will stay in this state until we are ready to integrate it into the application.